Annnnnnnd we’re back! How was everyone’s long…Tuesday? Good? Good! Good….So since it’s been two weeks there’s a lot going on that you all need to be updates on, so lets not wait another moment! So I do have a local area update for all you KW folk out there! KOI Music Fest is back again this year! For those of you who don’t know what the KOI Music Fest is, I’ll give you the run down. 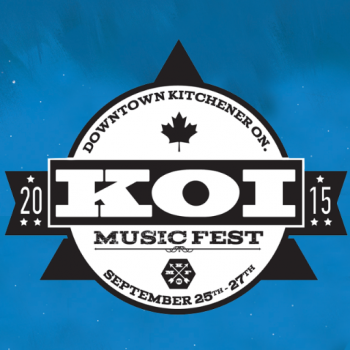 The KOI Music Fest is one of the best music festivals showcasing independent music within Canada. The main goal of the festival, aside from showcasing that amazing Canadian talent we’ve got, is to put the Kitchener/Waterloo area on the musical map. We are so lucky to come form such a musically talent area but because we’re so small we’re still working towards the credibility we deserve. KOI Music Fest works towards that each year! They’ve released a bunch of information with more to come SO I’m going to fire it out! It’s going to be an awesome festival with lots to do and see. Keep up with them and us for more updates, including headliners! So back a billion years ago (the beginning of June. The 3rd to be exact) I posted a link to get a free download (WHICH you can still take advantage of!) to AWOLNATION’s newest song I Am. Anyone remember that? Well they recently released their music video for that incredible track off their newest album “Run”! I’ve attached the video below, check it out and don’t forget to download that FREE track! Dallas Texas born, post-punk, synth-rock, with a pinch of salt and a dash of oregano band Nervous Curtains recently released their newest single Devastator off their newest album “Con”, debuting October 2nd of this year. Released along with this edgy punk single was a teaser video for their newest album “Con”. Although the intensity of their music is high, the passion is there and the talent is shown. We Came As Strangers has an interesting story. When they came together as a band they were, in fact, strangers! Guitarist for the band, Justin Sandercoe, was the only person who knew each individual member of the band before they came together, and according to him, they were all acquaintances more than anything. The band joined forces as an experimental project and ended up taking the unconventional-pop world by storm. ANYWAY they are set to release their third and newest album “Eyedom” on July 20th BUT I do have a link for a preview of their newest single “Still Life” which is to be released on July 20th! Award winning Aussie duo Oh Pep! Is due to release an new EP on August 21st! 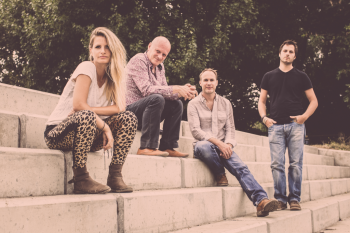 Their genre is hard to determine but according to their press release “they make a unique bland of folk, pop, country and bluegrass” which sounds like a cluster**** of different possibilities. BUT it is so true, although I have only been lucky enough to listen of one of the four songs on this EP it is very hard to pick one genre! Listen for yourself and tell me what you think! Okay so unfortunately my knowledge of Finnish music is not quite as vast as I was hoping it would be which is why I am only hearing about electronic producer Huoratron now. Strange isn’t it? WELL for all you EDM fans out there you will be happy to know that even if you’ve never heard of Huoratron before, you now have. Recently Huoratron as teamed up with BitTorrent Bundle to released his entire digital catalog. There are 7-chapters available for FREE download in which music, video, images and anything else you can dream of is ready for your enjoyment. Download the bundle here! Edmonton, Alberta born country singer Alee is a two-time winner of the ACMA for Female Artist of the Year. Scottish folk-noir artist Rachel Sermanni’s newest album Tied To The Moon was born on a 2014 visit to Nova Scotia. Hamilton duo Twin Within’s debut album Horizontal Lines with their next tour date being July 15th in Toronto at the Horseshoe! We here at Radio Laurier do love our international artists but always have a soft spot for our Canadians, so lets show them some love on their release date! That’s all I got for this week but I feel like it was a lot more than normal! Don’t forget to tweet, message, like and pin all of the things we do here at RL! See yea next week!